There are certain items that every kitchen needs, whether it is tiny or has lots of room to spare. In fact, the right tools will help just about anyone cook and prepare food like they were born to do it! 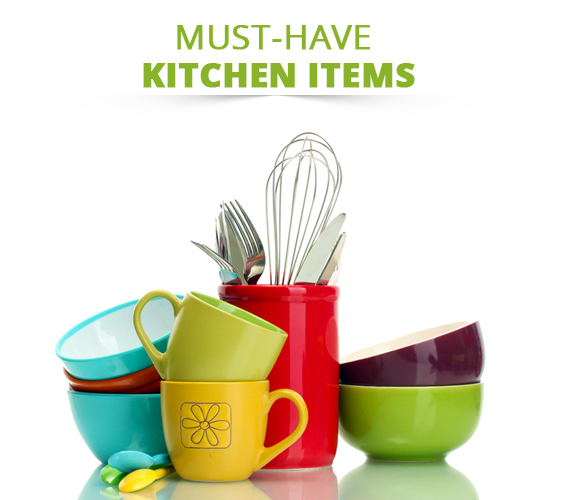 Listed below you will find the top ten items – or types of items – your kitchen will need to help turn you into a master chef! Finding the right knife is a bit like finding a perfectly fitted shoe: you will need to try them out to know. Stop in at a specialty cookware store and try holding different brands and styles to find one that feels right. Look for high carbon steel knives with a full tang: These knives will stay sharper, stain less easily, and give you the best level of control while chopping. Chef’s knife: Your main kitchen workhouse, a chef’s knife is used for slicing, dicing, chopping, and mincing. Prices vary significantly but this is a good item to spend a bit of extra money on if you intend to do much cooking. Serrated bread knife: Necessary for things like cutting tomatoes or slicing bread, a serrated nice cuts without crushing. Paring knife: Great for smaller cutting jobs like slicing lemons or cheese, paring knives can serve a variety of purposes. When entertaining, they can be set up with a bar cutting board for guests to cut their own garnishes. Poly cutting board: Dishwasher safe, poly cutting boards are more sanitary than wood cutting boards, which must be hand washed and can harbor bacteria. Set of metal sheet trays: Various sizes of sheet trays will be used all the time for a variety of jobs around your kitchen, from roasting veggies to cooking meats and baking cookies. Non-stick frying pan: Used to fry everything from eggs to bacon to fish, a non-stick frying pan is an essential in any kitchen. Be sure to use coated utensils so as not to damage the coating. Enameled cast iron Dutch oven: Essentially a large, heavy pot, Dutch ovens are extremely versatile and can go from stove to oven with ease. They are used to make soups and stews or even just for boiling water. Utensils: Your kitchen will need a large variety of utensils to help you handle and prepare food. Don’t skimp on items like mixing spoons, spatulas, and tongs as they are the extensions of your hands in the kitchen and will be used for stirring, folding, flipping, and scooping. Spring-loaded tongs are a great tool for flipping, grabbing, and serving a variety of foods while colanders will be essential for straining, draining, and rinsing. Finally, a microplane greater is perfect for grating everything from cheese to hard spices to zesting citrus. Measuring cups and spoons: Measuring cups are usually used to measure out dry ingredients while measuring spoons are used to ration liquids or strong spices in small quantities. Nesting glass bowls: Great for baking, making salads, and even storing foods, nesting glass bowls are just as important as a set of good metal sheet trays.